Continuing our tradition, first I would like to attach a weather report: Oslo 21°C Partly Cloudy, Warsaw/Wrocław 22°C Mostly Sunny To the point, you can download fresh stable release of Opera 16. Probably you're already using Next and/or Developer, so except rock solid stability, nothing really new for you. If you are on the Stable stream, you get the update automatically. wow, actually i wanted to download the next, but I will test this right away. Thanks for keep on working Opera. Oh, there is one thing that I find very annoying. In the tab the tab name is fading out. I personally dont like it because when I look at it my eyes are feeling quite unconfortable. In Opera 12 you just added a "..." when the name was too long. Is there a way to force opera to update? Where's the full changelog compared to previous stable? Thanks! We added a manual check when opening opera:about in Opera 17. What error do you get? And what platform are you on? Opera Mail ist kraftvoll und intuitiv und macht das Schreiben und Sortieren von E-Mails zu einem Kinderspiel. Powerful should be translated as "mächtig" instead of "kraftvoll". The latter commonly refers to strong muscles and engines or voices. When do you plan to update Next and Dev channel to reflect this change ? Thank you for the new version Does it mean Opera Next turns to O17 & Developer to O18?? Soon? Thanks for new buld and now let's wait first build of 18 dev? We should release Next 17 within 1-2 weeks. BTW: the "Clean Speeddial extension", developed by Saskatchewan, works also in this release . Does it mean that Opera 16 (stable) is now the same with Opera Next 16 until the Next is turned to 17? Hello. I know it may be a little off topic, but I am not quite sure where else to contact you. Thank you very much for answering if you have a bit of spare time. 1) I would like to ask if you ever plan to change the behaviour of double-clicking the browser window (on Windows). In O12, wherever double-clicked new tab was opened, but now that works only for the + button and clicking elsewhere changes the size of the windows. 2) About tabs. will there be some option for wrapping opened tabs to multiple lines? 3) Will there be an option for starting countdown when the X (close) buttton pressed. For canceling, force quitting or hiding to status bar. 4) About Opera Mail. Will the Opera Mail be ever synced over the Opera Link? And will be desktop Opera synced with mobile ones? And maybe are you ever planning on building mobile email client? Thank you for reading and answering. Have a nice day. why and how the software download sites release new versions of opera earlier(hours or even days!) 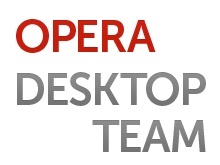 before the official website of opera? We are not working on this and currently this change is not planned. But definitely I would not use the word "ever". We are currently working on more cool options for handling tabs. Currently we don't have plans to include Opera Mail in Link. ...Currently we don't have plans to include Opera Mail in Link. Thank you very much for the quick reply. The countdown I meant was for closing the whole window of Opera, not just closing one tab. Ar you sure it works in this build? shouldn't be becouse of "opera:// URLs" option is removed. If you nees RSS, you should try SmartRSS as well. A Home button and an option to autoclear all history on Opera exit. WARNING: there are _NO_ bookmarks in Opera 16. You are forced to use speed dial, or try your luck on finding the right characters in autocomplete. If you hate Speed Dial as much as I do, DON'T UPGRADE! It is blazingly fast though, but without customization and personalization features, it is easy to be fast. Yep, I am pretty sure, I checked this by myself on my Windows. within the "opera:flags", or you just didn't follow all the steps I mentioned in my previous post above? Can't confirm, for me it closes just the private window. Does the first window have to be empty? It does it even if some tabs are open in the normal window. Portable install by the way (only save as .mht and opus codec enabled besides the defaults with flags). We have plans to add more customization options for SD. Can't confirm, for me it closes only the private window. I think you are missing somthing, pls be sure if you use 16 stable version...This option is removed. Nope, I just installed the extension myself. As for speed dial, I'd like Opera web mail to have a nice overview of last mails in SD thumbnail, like in O12. I discover O15/16 don't correctly service REFERER. After sending form when server asking about $_SERVER['HTTP_REFERER'] (php) Chropera give empty string. ALL over browsers work correctly. I hope that you fix it as soon as possible. Odkryłem, że O15/16 nieprawidłowo obsługuje REFERER'a. Po wysłaniu formularza serwer pyta się przeglądarki w php o $_SERVER['HTTP_REFERER'] i dostaje pusty string. We wszystkich innych przeglądarkach dostaję prawidłowy string. Nam nadzieję, że naprawicie to jak najszybciej. When can we expected the private tab? bro dev! and when the Opera 18 will be alive? is it true when Opera 17 goes to streams Next, no more features added? Opera Next 16 will be update to this version or not ? Found it, '--single-process' cli switch caused it. I still don't understand the difficulty adding these basic features in Opera Blink. Yes, it is true. Next stream means feature completed. The difference between Next and Stable is just bugfixes. Version 17 stable could make me change default browser from Firefox to Opera, but eventually, I don't see it happening, unfortunately. My first major alternative browser -other than IE- was Opera back then, the version with the banner that you needed to look in dark places for the key to crack it... Afterwards, I went with Fx 3.6 when you were adding bloat-related, "hypsteristic" stuff and you forgot your own moto: "The Fastest Browser on Earth". Now was almost a good opportunity to return to Opera. You started very well with the Windows Native UI, but now besides the most important feature -the core which is Google's, now you took even the bookmarks bar as-is from Google... Don't you want to work at all? Would be great a little effort in order to build bookmarks bar and even speed-dial as native as it gets... On Win8 the small UI part that is native looks great. Now bastardised UI starts looking like Circus. Unable to highlight (select) text in links. Showing comments 1 - 50 of 260.